I learned a new acronym . . . FoMO. Apparently, it’s a common condition suffered by many of today’s digitally connected individuals. For them not in the know, it’s Fear of Missing Out. I’ve done some reading and to me — the amateur observer of the human condition — it seems no different from something I’ve noticed all my life. Meaning, people have a desire to participate in and/or experience events. This desire is especially strong if two conditions are present; if the event is deemed more interesting than one’s life and if the people involved are deemed more interesting than ourselves. Underlying this desire is another desire; the desire for attention and/or recognition. I do think the advent of the InterWeb and social media has amped up the FoMo anxiety. Psychologists and psychiatrists and psy-these-or-others point to studies explaining the behavior but to the simple-minded — me — it seems fairly simple. People are looking to others for validation of their own existence. No one is immune to this, but there are degrees. For instance, I can’t claim to be above it all; recognition is a nice thing. It’s why I’m making a half-assed attempt at getting published. It would be recognition of whatever writing ability I possess. It would certainly validate my yet-unproven assumption that I’m “a writer”. Where I draw the line — and where many fail to draw the line — is at doing something I don’t like or don’t want to do. This is a tricky thing. Obviously, if my interest is to get as much attention/recognition as possible, there’s probably no line I wouldn’t cross. So, there’s actually more to it. The “more” is the confidence in one’s inherent self-worth. There is a profound difference between attention as a substitute for self-worth and attention as an affirmation of self-worth. I can’t touch on this too deeply without going into various side paths and often convoluted exploration of how the mind works. I’ll just say that if you don’t have a sense of self-worth, if you cannot find it within yourself, if you don’t accept your value as an individual, there is no amount of outside reassurance and attention that will fill that void. So, where am I going with this? Eh, I’m just shooting the breeze . . . but, I also want to say that what you see on Facebook, Instagram, Twitter, and other social sharing sites is often a very sanitized version of people’s lives; don’t judge yourself or your life by what you see on social media because chances are it’s an illusion. I’m in a place that’s awash with tourists — a veritable paradise, some say — so let me describe something I see every single day. I will see a group — be it a family or friends — and they’re either milling about or walking down Aliʻi Drive. They’re not looking particularly happy, nor are they unhappy. They just are. Given a mutually agreed-upon signal, they all cluster in front of an outstretched arm that’s holding a phone and all of a sudden, they are beaming. Hands are flashing the “ok” sign or the “hang loose” sign and it looks as if they’re having the time of their lives. Within seconds, they revert back to people milling about or walking down Aliʻi Drive. They’re not looking particularly happy, nor are they unhappy. They just are. Mind you, the people here might be having a good time; they are, after all, on vacation. But, they just flashed an enhanced version of what they’re actually experiencing as they walk down Aliʻi Drive in 90º weather, that feels like 102º, past the homeless people asking for a handout, and just before they go eat at a restaurant that will charge them a premium for a just-average meal. They will probably also photograph the meal and say it was great (unless it has Spam on it, it probably wasn’t any better than food anywhere else). You know all those family photos you see of people that look like they have perfect lives? Remember, they’re just having lives. There may be different plusses and minuses to their lives, but without knowing a lot more about them, don’t be so quick to compare your life to theirs and assume yours doesn’t measure up. Most of all, don’t try to copy what you see thinking it will magically improve your life. That’s not to say you can’t improve your life . . . but you must approach the effort with an eye to the reality of the world that surrounds us and a realization that happiness seldom comes from outside ourselves and that not being unhappy is not the same as being happy. Wow, that’s deep. By the way, if you need help, seek professional help. I’m just making observations for my own benefit. THIS article purports to offer advice. Also, THIS article. I should also mention you might be a lot happier if you get every one of your friends and your friend’s friends to follow and read this blog and hang on my every word. Donating money might help you all feel even happier. If it makes it easier, I can wear robes and pointy hats and speak Latin and wave smoking pendulums as I gather your donations. Them things look deadly . . . They remind me of carpenter shark teeth. They belong to the family of rays and I’ve seen (supposed) weapons made from them. I’ve seen weapons that have shark teeth embedded in their edge but this comes ready-made. You just have to wrap the base with some cloth or rope and you have a fairly scary weapon. Again, not from those leaves . . . those would hurt, to be sure, but they’d make lousy swords. The joke today is a little dated . . . I mean, does anyone read an actual paper on a train anymore? I’d imagine it’d be a tablet or phone. On the other hand, you probably don’t hear “excuse me; are you done with that section?” much anymore. People do, however, still take the train, especially into cities . . . because, often, there’s No Parking. It takes a brave person to share moments of unhappiness. Oh, I don’t know. Many people these days are just whiners who go out of their way to look for stuff to be unhappy (and complain) about. But yes, for people with genuine problems it is a courageous thing they do when they ask for help . . . although it occurs to me that I’m not sure that’s what you mean. Also, I’m not suggesting sharing unhappiness . . . I’m saying don’t lie about your state of being. Not to others and not to yourself. The photo looks like the stems of our Mexican fan palm fronds…as a kid, always thought if I was desperate I could grab the leafy “hand” and wildly swing the stem like a sword…maybe a poor one, but might keep someone at bay. Those darn prongs not only slash, but sting – wonder if there’s some sort of plant ooze defense naturally in them. I must have watched too many Sat afternoon grade B movies of jungles and space aliens. Silly, perhaps, but maybe more developmental than social media that mesmerizes so many kids now. If I were intrepid, I’d look the plant up . . . I’ve seen it listed as Aloe Vera variety and also a spiked cactus plant. It could be one or the same or neither. 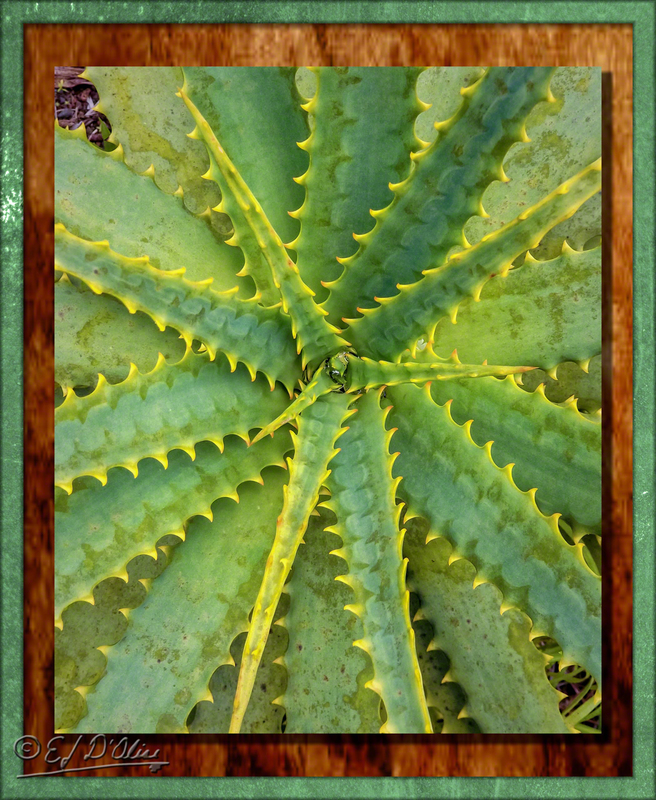 If it is an aloe vera plant, it makes for a poor weapon as it would help heal the cuts it makes. So that’s what it is. The aloe I have is smaller much cleaner with plump smooth leaves. But my neighbor has a larger variety with spikes. Excellent blog, Emilio! Good thoughts! Great wisdom! PHOTO: Reminds me of saw blades. But, beautiful! CARTOON: HA! :-D I saw a scene in an older movie recently where everyone in a waiting room was reading a newspaper. Wow, in real life I have seen that in like forever. DOODLE: ‘Tis the epitome of No Parking and done in a fun way! The funny part is that when people “pose” to present an unrealistic version of their life it never dawns on them that others are doing the exact same thing. I don’t know how I would feel about The Cult of Disperser. Given that I’m fairly antisocial, members would have the same tendencies . . . no one would ever show up for the meetings. Cryptic message: I’m curious to know what you’ll think of tomorrow’s post. It’s never ever been a problem for me, perhaps I’m just simple, or lacking ambition, and I sure as hell am not going to start now. Or, your life is so great that there’s none better.
. . . well, except for the Internet thing. Oh, and that domain name thing.